IFA 2015: Samsung to launch new Wireless Audio 360 speakers | What Hi-Fi? The three new models sit below the existing R6 and R7 which were originally unveiled by Samsung at CES in January. Like their larger siblings, this trio are all omnidirectional, and use ring radiator technology which allows them to fire out music all around. They also feature new physical controls on top of each unit, which respond to a variety of touches, taps and swipes. 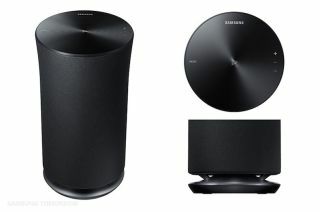 All the wireless speakers work in tandem with a new version of Samsung's Multiroom App for Android and iOS devices. You'll even be able to control them using the company's Gear S smartwatch. To coincide with the launch, Samsung has teamed up with Qobuz so you can access and stream its complete catalogue of digital music files through the new speakers. There's no word on whether there will be any kind of subscription offer included as part of the deal. The R1, R3 and R5 will all go on sale during the fourth quarter of 2015, with US prices ranging from $199 to $399. UK pricing is still to be confirmed. We'll bring you more information from the showfloor when IFA kicks off on 4th September.